Grandma El's Diaper Rash Remedy + Prevention. I can't emphasize enough how much I love this product. I've written about it twice - here and here, and I think this product deserves a third post. Yes, this product deserves more than a two blog posts and now it's getting it's third. I just came back from our yearly travel and it was more than timely, since going through what I went through - it was a welcome change (even if it was just a few days). Since I am still waiting to expel it completely (naturally), I needed to wear napkins everyday for protection. And when the environment of the city we were traveling in is very hot and really humid and you walk practically 90% of the time - there is definitely friction somewhere down there. On our second day - I felt an irritation - think of it being caused by the heat and of course *friction* (from all the walking) I'm sure our kids' diaper rash is caused by the same conditions. I was more than glad and so relieved to have brought a new tube to Grandma El's Diaper Rash Remedy + Prevention in my luggage. So that evening, when we finally got to the hotel, I settled down and decided to take a bath. After I bathed, I applied it immediately. I knew it was a miracle product as I've been using it ever since I learned about it. But after applying some at that time - it was still really irritating, uncomfortable and a bit painful. I put more product, just to be on the safe side. I was relieved that it was towards the end of the day that I felt the irritation - perfect timing. When I woke up the next day - the pain was gone. No more irritation, no more pain - it was as if nothing happened! I was really happy - I knew this product so well and I tell you, it's really a miracle product! Thank you Grandma El's Diaper Rash Remedy + Prevention, it saved my life (well not in the literal sense but, you get what I mean - I was staying a few more days and I having that irritation - it would ruin the trip most definitely) So everyday, I put the product ever so thinly and it really helped. After that one time, I never felt the irritation and pain - I was able to go through my travels without a hitch. Thank goodness really for Grandma El's Diaper Rash Remedy + Prevention. A few weeks back, I got invited to Grandma El's launch. I was so proud and happy because this product is distributed by my next door neighbor. I believed so much in the product and I was raving about it to my blog friend (that were in the event as well). I was telling them that I even used Grandma El's Diaper Rash Remedy + Prevention as a lipbalm! Yes - the product is that good - it can help your dry chapped lips, it smells wonderful and it tastes yummy (this is true! !, I'm NOT kidding). I love this product very much that I have it in my bag, everyday (yes, I need to say it again and again!!) Grandma El's also has lotions, baby washes and baby shampoo! I am so happy that this product is very versatile - great for kids and adults alike! It's not sticky, it spreads easily, it's in a tube (you can easily get the right amount of product and is sanitary!) plus, you don't need so much product. A little goes a long long long way! If you put this product side by side with Desitin, Grandma El's Diaper Rash Remedy + Prevention is a runaway winner, hands down. I have used Desitin since Kailee was born and I hated the fact that it was sticky, paste-y, it's so hard to wash off (I don't think you can even wash it off), and smells so bad! Grandma El's Diaper Rash Remedy + Prevention is the exact opposite and is more magical, if you ask me. Can you use Desitin on your lips? No effing way! SUPER thank you, Vanessa for bringing this product to our shores. Now we have an alternative to that icky yucky diaper rash cream. I swear, you need to try this product to believe it. And yes, three posts here on my blog for the same product - I definitely LOVE this product. 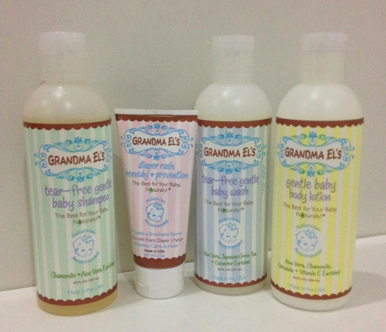 Grandma El's products are available in Babyland stores, Robinson's Supermarket, and Metro Gaisano. You may also check online shops like Lazada, Cudsly, Bambino Baby Shop and in Cebu - Bao Bao Babies. Grandma El's Philippines is also in Facebook!